Heating and hot water systems can only reach their full potential if their use is optimized by a control. A heating control regulates the parameters and settings of your heating system and adjusts them to your individual needs. Control and regulation processes are necessary to use a heating system efficiently. The systems are affected by one or more input and output variables. This may be the intensity of solar radiation or the external temperature, for example. The continuous measuring of actual values (i.e. real temperature in living room) and comparisons with desired values (i.e. preselected temperature for living room) enable the system to adjust itself so that the target values can be reached. Almost every heating system now has a control. Controls are essential in systems that combine multiple components. For example, in a gas condensing boiler which is combined with a solar thermal heating system and a storage. The control orchestrates the efficient collaboration of the components. The only thing you need to do is to set the desired room temperature. The control takes care of the rest. 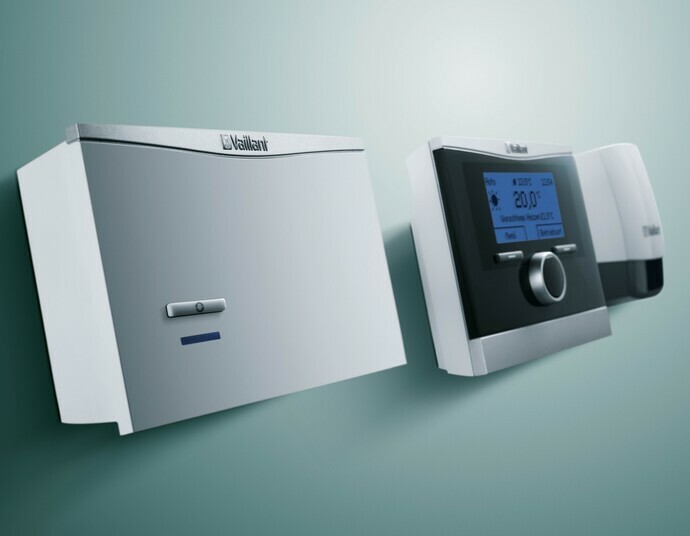 Vaillant heating controls ensure that your system works at the optimum operating condition, thus helping to save energy. For example, a weather-compensated controller automatically adjusts the flow temperature of the heating water to the outside temperature. Alternatively, the heating times can also be individually adjusted, so that during a brief absence the temperature is lowered while in holiday mode it can heat up again in time, so you don't return to a cold house.